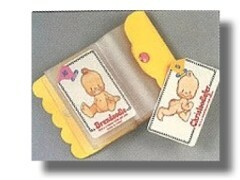 Each Oodle came with their little Collectaboodles card that had their number and a portrait sketch of them on one side and information about them on the reverse. 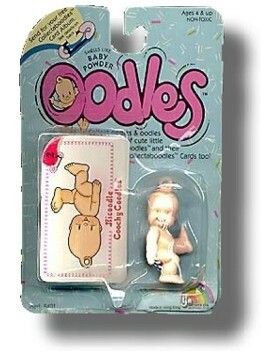 I don't know what they used to impregnate them with the scent, but even today, if you sniff an Oodle, you will see that amazingly, they still retain their baby powder smell. 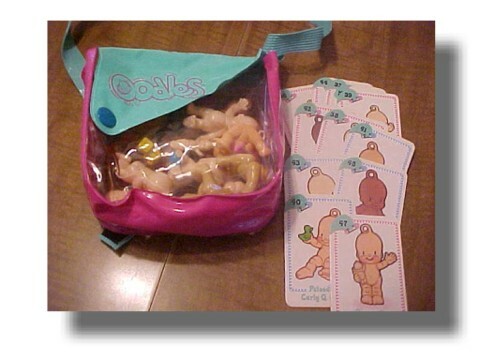 Oodles were sold individually in blister packs as above, in sets of 6 Oodles that could be strung together through their oodle loops to make a bracelet and also in family sets of 12, withtheir own Carry Along Purse to keep them in, like the one below. The purse has two built in pockets inside to hold the cards.